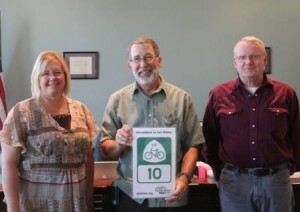 John Pope, WA Bikes board member and volunteer USBRS route coordinator, has put foot to pedal and is riding the newly designated USBR 10. 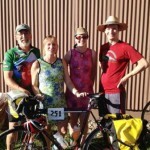 His wife Michele is providing vehicle support and chronicling their cross-state adventure. 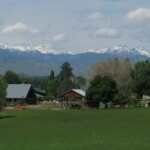 We hauled out of Colville in the morning with the goal of making it as far as Ione, crossing over the Pend Oreille River and camping at Edgewater Campground. This is also the crossing that takes you to Leclerc Road and the last stretch of the journey into Newport. We played our usual game of me driving a distance of 10 miles or so ahead then pulling over and waiting for John to catch up. The climb from Colville was steady and the pavement and shoulder quality were good, John felt it was one of the prettiest Tamarack forests he had biked through. It was going to be a relatively short day. John’s legs were fresh after a day’s rest and he was making good time. My job for the day was to investigate possible campgrounds for future cyclists. It should have been a sign of what was to come when the two campgrounds I checked were closed. We were now out of the hills and the day was getting hot. With John about a half-hour behind me, I got to the outskirts of Ione and across the stunning red bridge to Edgewater Campground. We were there in time for an early lunch and restful day in camp. Only catch was that Edgewater was closed for the year too. Decision time. It was disappointing news for John but the only choice we really had was to keep moving toward Newport and hope to find Panhandle Campground open 20 miles ahead. 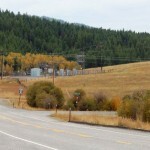 Leclerc Road is a beautiful stretch along the Pend Oreille River. Traffic was light, the drivers were courteous, and the road had both brand new pavement and some of the roughest chipseal along the way. I probably don’t have to tell you that Panhandle campground…was CLOSED. Our destination would have to be Newport. We broke it up into ten-mile goals. “it’s only 10 miles to the Manresa Grotto. You can do that,” or “It’s 10 miles to Usk. You can do that”. At Usk John took a 2-mile chance at a back road that turned into a gravel road. He was going to have to pull the last 16 miles of his adventure on a busy stretch of Hwy 20 at the end of a long day. Normally 16 miles would seem like nothing but his legs had gone from fresh to exhausted and his shoulders were cramping. He just kept moving. Naturally, just to make things more exciting, the big hill comes in the final mile. After John’s very long 92-mile day, the ‘Welcome to Newport’ sign was such a relief. It is a small sign–no bells or whistles–but sure looked beautiful to us! I stopped at the Safeway in town to buy John some chocolate milk for an immediate reward and a bottle of scotch to celebrate at camp. We got to the OPEN Pioneer Campground a few miles out of town. John took his well-deserved shower and I was making dinner when it occurred to us that I had left the scotch sitting at the cash register. I don’t know which was worse…losing John on the trip out of Twisp or losing the scotch on his last day. On our way out of Newport John stopped by the County Courthouse to thank Commissioners Steve Kiss & Karen Skoog. Unfortunately Commissioner Mike Manus was on vacation. 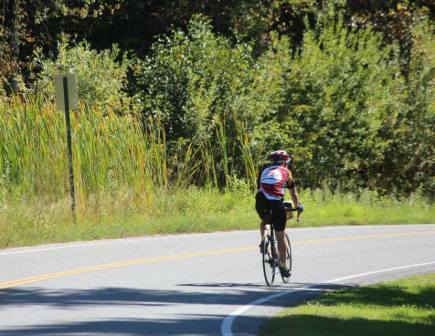 Mike had worked with John on USBR 10 and he was sorry to miss him. 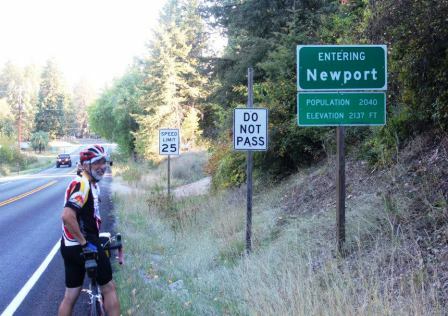 Including the USBR 10 spur route to Ione, John pedaled 440 miles in six days! This doesn’t include his layover day in Colville where he rode the short route in Blazing Saddles Bike Ride. 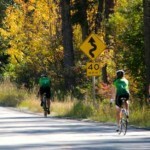 Want More News About Bike Travel in Washington State? Sign up for our e-news! This article was posted in Adventure, Tourism, Travel, USBRS and tagged Newport, usbr 10. Bookmark the permalink. Follow comments with the RSS feed for this post. Both comments and trackbacks are closed.